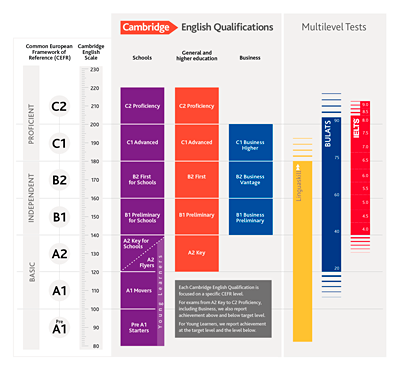 Cambridge English exams in private, grant assisted and state schools. The Cambridge English nationwide initiative to promote Cambridge English exams within the school sector continues to have a widespread positive impact on the students’ level of English. Under the National Schools Project agreement students can take the following Cambridge English exams in their own school at a lower price: Young Learners (YLE), B1 Preliminary, A2 Key, B2 First and C1 Advanced. The main aim of the project is to facilitate and reinforce the learning and teaching of English within the Spanish schools system through Cambridge English exams. Signing up is simple and all formal education schools may apply to join the project. Greater confidence: younger students lose the ‘stage fright’ that comes from taking an exam at an unknown external venue. They are more relaxed and this has a positive effect on their overall performance. Increased motivation: children work harder and want to show what they have learnt. Normality: Cambridge English exams become a familiar part of the learning experience as they are integrated into the school curriculum. Projection: Schools aim for students to finish ‘Batxillerat’ with C1 Advanced. Our Cambridge exam centre provides a wide range of help and support to schools and teachers. We offer an extensive support programme which includes free seminars, round table sessions for teachers, materials, etc. These services along with lower exam fees gives students greater access to Cambridge English exams. Joining the National Schools Project is easy and has lots of advantages: your students can take the Cambridge exams at your school or at one of our many exam venues, the exam entry fee is cheaper for both students and staff at your school and your teachers will benefit from our extensive support programme. Step 1 Please contact us on info@exams-madrid.com or tel: 914 184 796. We will be happy to discuss your needs and give you information and support to help you accomplish your school’s specific goals. The NSP agreement does not oblige your school to provide a minimum number of candidates each year. The main aim of the agreement is to ensure that your school has exam rooms that fully comply with the Cambridge English exam regulations, that you are adequately insured and that you do not use the Cambridge English logo unlawfully. You can hold an exam session at your school as long as you have a minimum of 10 candidates per level. If you do not have enough candidates they can still take the exam at one of our open session venues at NSP prices. You can see our exam venues in the page dedicated to our centre. 1. Choose a date for your session from our exams calendar. We can organise an exam session in your school on any of the dates offered by Cambridge English including those not available on our current exam calendar. Remember that minimum candidate numbers apply for all exam sessions in schools. Once you have chosen the date please contact us for confirmation and to find out the final entry date. (Please note that final entry dates are normally 5 - 7 weeks before the exam in the case of paper based tests and 3 weeks before the exam in the case of computer based tests. 2. Call us with your proposed exam session date on tel. : 914 184 796 or send an email to registrations@exams-madrid.com. 3. Once we have confirmed the date of your session you should complete the exam registration form, send it to us at registrations@exams-madrid.com and make payment before the final entry date. The YLE tests are on-demand and you can choose the date. If you would like to organise a YLE session at your school please contact us with your preferred date. Once we have confirmed your session you should complete the registration form, send it to us at registrations@exams-madrid.com and make payment no less than 7 weeks prior to the exam date. Individual tables/desks which must face in the same direction. Each candidate must be seated no less than 1.25m away from other candidates in all directions. Your school must provide a supervisor who should be available for the duration of the exam session. Prior to the exam session the exam materials must be locked unopened in a solid metal cabinet or secure store-room. The store room must have a solid locked door and limited access. If there is a window it should have bars or there should be a burglar alarm installed. Your computers can be laptops or desktops - please contact us for the technical specifications at info@exams-madrid.com or tel. 934 111 333. 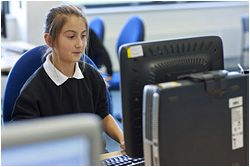 If your computers are less than 1.25m apart you will need to place separators between them to prevent students from seeing other candidates’ work. A computer technician must be available for the duration of the exam session. Cambridge English and Exams Madrid take exam security very seriously. Watch this video to learn more about the high levels of security have built into every stage of the exam process; from the production of exam papers and what happens on exam day at the exam centre, to the integrity of exam data. If children learn English when they are young, they will have a significant advantage when they leave school. The Cambridge English exams are valued around the world and, with a Cambridge English qualification, children can access the best study, work and life opportunities. Taking and passing exams at the right level – from beginner to advanced – helps build your child’s confidence. Your child will become more proficient and more fluent with each step. All the exams are linked to the Common European Framework of Reference for Languages (CEFR) - the internationally agreed standard to describe language ability. This makes it easy to see the progress your child is making in English, and for employers and educational institutions to recognise your child’s ability when they leave school. Thousands of schools prepare children for the Cambridge English exams. Check if your child’s school is already one of the 40,000 Cambridge English exam preparation centres around the world. Sign up for the Young Learners Cambridge Assessment English Parents Network. A website with materials, games and information designed to motivate and encourage your child as they work towards the Cambridge English Young Learners. Sign up to receive the Cambridge Assessment English free parents' newsletter, containing news and activities for you to help your children learn English. Shows your child can use everyday English at a basic level. Shows your child can use everyday English at an intermediate level. Shows your child can use everyday written and spoken English at an upper-intermediate level for work or study purposes. 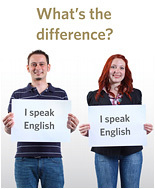 The internationally recognised standard to study and work in English-speaking countries. Our highest level exam which shows a person has exceptional English. 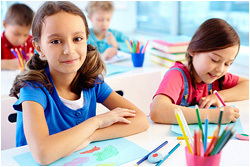 Cambridge English is dedicated to maintaining the deepest possible understanding of how children learn English. The research team at Cambridge English Language Assessment conducts thorough, rigorous work to understand in detail how children acquire vocabulary, get to grips with grammar and gain confidence in speaking and writing a language. They also look at how tests support a candidate writing, listening, reading and speaking in the real world outside the classroom. Throughout the world, English is recognised as an essential skill and is an integral part of the curriculum in primary and secondary schools. Find out how Cambridge English can support your teachers in achieving English language learning, teaching and assessment goals. Exams Madrid offers a wide range of free seminars, information sessions and teacher round tables throughout the year. A wide range of free teaching resources and information to support teachers. Register for a free account to download lesson plans, worksheets, games, classroom activities. The Cambridge English webinars for teachers are free to join and led by a team of experts from Cambridge Assessment English. These experts will also be available to answer participants’ questions. This specialist online space provides courses, articles, webinars and the opportunity to connect with teaching professionals worldwide and develop your career. Cambridge English provides first-class career development for English language teachers and is committed to raising the teaching standards in the English Language Teaching (ELT) industry. 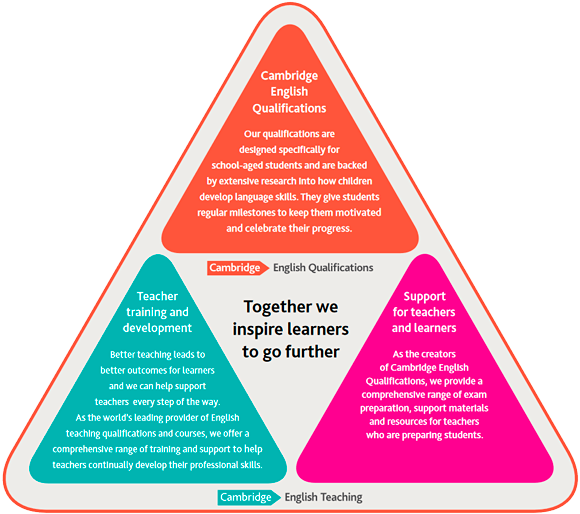 The Cambridge English internationally recognised teaching qualifications provide a route into the English language teaching profession for new teachers and career development opportunities for experienced teachers. TKT (Teaching Knowledge Test) will help you to teach English to schoolchildren and adult learners at home or around the world. Use TKT to increase your confidence as a teacher and improve your job prospects. You do not need to be a native English speaker to take TKT. TKT is recommended for candidates with level B1 or above. Cambridge English certificates open the door to exciting study and work opportunities for students when they leave school. Universities, institutions and colleges, such as ESADE , San Pablo CEU, La Salle Centro Universitario, Universidad Autónoma de Madrid, Universidad Carlos III, IESE Business School, Universidad de Alcalá de Henares, Colegio Universitario Cardenal Cisneros . Employers, such as Banc Sabadell, Grupo Danone, IKEA Ibérica, Caixabank, Nestlé España, Sol Meliá, Sony España, Barceló Hotels & Resorts, Catalana Occidente. To find organisations, employers, universities, colleges and other organisations that recognise Cambridge English exams, visit the Cambridge English Recogniton Online Database. All The Cambridge English exams are linked to the Common European Framework of Reference for Languages (CEFR) - the internationally agreed standard to describe language ability. This makes it easy to see the progress your students are making in English. Students gain confidence as they work their way up the exam levels - getting experience and qualifications that show their skills in reading, writing, listening and speaking. The Cambridge English exams for schools are informed by years of research and reflection on how children like to learn, and how they learn best. Research helps to ensure that the exams are designed for children first – that they are non-threatening, motivating and have a positive impact on teaching and learning. Cambridge Assessment English is happy to provide schools which actively prepare candidates for the Cambridge English exams with the graphics below (which are Cambridge English trademarks) to help promote exam preparation courses. Please note, however, that permission to use these graphics is dependent on you continuing to prepare students and your agreement (by use of any of these graphics) to comply with these regulations (which permission and compliance is governed by English law and subject to the English courts). You are welcome to use these graphics in your publications or websites, as specified below, but in doing so you must accept that permission to use them may be withdrawn at any time, and that you must cease to use them (and withdraw any publications in which they are printed) if requested to do so by Cambridge English. For the avoidance of doubt you are NOT permitted to in any way use the Cambridge English shield logo which appears at the top of your preparation certificate (other than by display of that original certificate). The graphics must always be used in exactly the format and proportions shown above. You must not under any circumstances attempt to alter or recreate the graphics or retype any of the wording. You must also ensure that any designer or printer working on your behalf complies with this requirement. You should ensure that the colours are reproduced accurately. You must not use a copy of these graphics obtained from any other source. 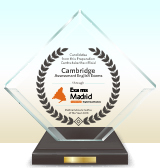 Centre that register students for Cambridge Assessment English examinations through Exams Madrid are welcome to use these logos on their websites, leaflets or other publicity material. The logos can be downloaded in both high and low resolution following the link below. Play our games: Practice your English! To keep customers happy and reach the next level, players need to make sure that the right orders are placed in the box. Each level offers more new words. With Shop and Drop children can build vocabulary and compete with other English language learners around the world. They will also be able to see their name on the national and international leaderboards. Parents please note: before you can access level 3 we will need a few contact details from you. Join Monkey's trip around the world and play 8 mini games, including 2 new games to practise listening skills. Unlock games as you progress – but watch out, they get harder as you go along! Play the game on our website or download the FREE app on the iOS App Store. Android users can play Monkey Puzzles World Tour on our website with an internet connection. You are captain of Cambridge English FC football team in our fun, new learning game. Answer English grammar, vocabulary and pronunciation questions to help your team pass the ball, get to the goal, shoot and score. Get the questions right and take home the cup. Get them wrong and you may be sent to the bench! Available on the App Store and Google Play to download. Skills practised: Vocaburary and grammar. Enter a fantastic world of fun for Starters, Movers and Flyers exams. Play exciting games to practise and learn key vocabulary for Cambridge English: Young Learners exams. It’s perfect preparation for Young Learners or simply a fun way to practise English at an early stage of learning. Ideal for English learners and great word fun for kids of any age. Available on the App Store and Google Play to download for free. Visit Funland and play a range of classic fairground games to practise your English language. Control the ferris wheel, splash the clowns and collect prizes along the way. Available on the App Store and Google Play to download for free. An unknown alien life form lands on earth and has to learn English to get around. Progress through different difficulty levels by helping the alien use English in a range of situations such as shopping in a bakery or visiting places such as an art gallery and library. Encourage your learners with fun vocabulary practice using these interactive games. Extend and consolidate your lessons with this selection of interactive activities co-developed with Modern Education Network Limited. This Cambridge English new audio series tells a story about university students Geeta and Paul. They are struggling with their coursework, when a mysterious professor offers to help. Each of the seven episodes comes with B1-B2 level activities to help learners practise the language used in each episode. Write & Improve is a research project carried out by Cambridge English Language Assessment and iLexIR. As part of the research project you will be able to submit your writing and receive feedback on it. You can then use the feedback to improve your writing. These Apps are designed to be a fun, motivating and useful free time activity for students. The collection comprises of practice test apps, addictive games such as English Monstruo, Phrasal Verbs Machine, Phrasalstein or Quiz your English. Help your students make friends with other English learners around the world through the fun, international Cambridge English Penfriends activity. Your students will design and share cards with learners at a school in another country. Some 200,000 students in more than 7,000 schools are already exchanging cards with other English learners in over 100 different countries through Penfriends. We hope that your students will have fun making new friends and developing English language skills in a way that is practical, fun and communicative. It’s a fantastic way to get your students excited about communicating in English! Watch videos featuring English learning and exam tips on Cambridge English TV YouTube channel. Go to this link and fill in the form. You can use it to ask for further information too. Amend your website, course literature and offer letter to state which Cambridge English exams and which scores are accepted by your institution – and for which courses. Sign up for the free, secure online Results Verification Service to instantly verify applicants’ exam results and view their test-day photo. To register, go to www.cambridgeenglish.org/verifiers. To find out more about how you can use The Cambridge English exams to benefit your institution, email the Recognition team at recognition@cambridgeenglish.org – Cambridge English will be delighted to provide more information or organise a meeting. Already accept Cambridge English exams? Make sure you let Cambridge English know so it can keep you up to date on developments and include you in the Global Online Recognition Database so candidates know they can apply to your institution.